There was a time when laptop computers were strictly for use on the go, when you were away from your desk and needed to get work done. Laptops have become most people’s only computer, providing desktop like power with portability. In some cases you may want to keep your laptop in a more permanent place in your home, and UPPERCASE KRADL Air is a product for that scenario. 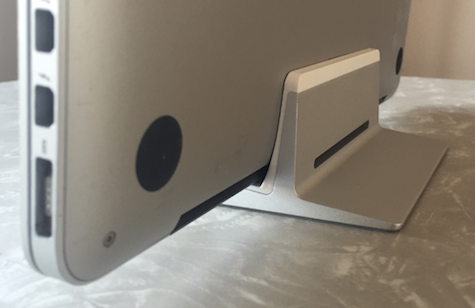 The KRADL Air is a vertical stand for MacBook Air (11 and 13 inch, 2010 and newer). 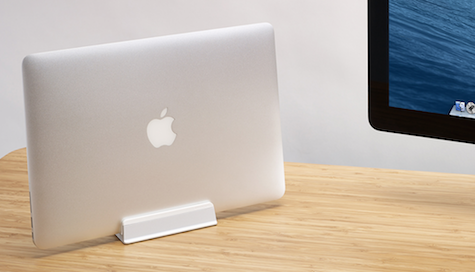 It allows you to stand your laptop Mac on its edge. In the stand, it takes up considerable less space on your desk and when connected to a monitor and a keyboard you can have a desktop-like setup with your MacBook Air. You can use this stand for charging your laptop when not in use. In this configuration it again reduces its table space and lifts just enough off the surface to protect your precious laptop from the inevitable spills that seemed to be drawn to our favorite, expensive devices. This is a simple product, there isn’t much to it, but the attention to detail is what makes this a great stand. UPPERCASE has definitely studied the design process of Apple and has made a accessory that looks like it could have come from Cupertino. There are just three parts to this stand: the frame, the base pad, and the internal frame. The frame is made out of aerospace-grade aluminum, and if you have handled a MacBook Air you are familiar with this material. While the MacBook Air uses this for reducing weight, the KRADL has a heft to it that assures you that placing your laptop in it will not result in the whole thing tipping over. There is a silicone rubber base pad that keeps your table or desk surface protected from getting scratched, and there is a plastic internal frame in the aluminum frame that also protects your laptop from the base. The KRADL design was put together thoughtfully to complement the sleek design of the MacBook Air and provide protection or give a smaller footprint for space constrained places. Look at the gallery of excellent photos on the product’s dedicated web site.